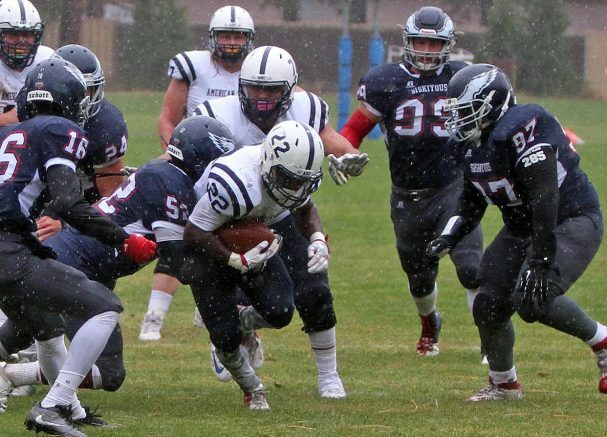 Rain was pouring down on Saturday, but it didn’t stop American River College’s football team as the defense led the way to a gritty 7-0 victory over College of the Siskiyous. With the field drenched in rain and strong winds blowing throughout the game, the Beavers’ defense was able to hold their opponents to just 108 total yards. Coach Jon Osterhout applauded how well the defense performed as a unit against Siskiyous on Saturday. “The defense was outstanding, it’s was a combination of things like tackling well and holding Siskiyous in check the whole game,” Osterhout said. Siskiyous fumbled on its first drive of the game, which allowed the Beavers to start their first possession on the opponents 35-yard line. The Beavers successfully converted on a fourth down try, but eventually the drive fizzled out and ARC came away with no points. This proved to be the theme of the game as the teams combined for 10 turnovers and 11 punts. Freshman defensive lineman Adam Lopez knew that throughout that it was going to be a tough game. “Coach throughout the week prepared us for this kind of grind it out game and told us we as a defensive had to win the line of scrimmage and tonight we were very successful at that,” Lopez said. ARC got another opportunity when a first quarter drive was extended on a Siskiyous offsides call, but this time the Beavers took advantage when Sophomore running back Robert Frazier ran for five yard rushing touchdown to put the team up 7-0. Frazier commented on what he saw during the only score of the game. “We were on the goal line it was a dive play on the left and I cutback, there was a big hole there and I ran through it as fast as I could,” Frazier said. The offensive line for the Beavers on that drive and throughout the game had a big impact on the game, giving the running backs holes to run through and freshman quarterback Griffin Dahn time to execute the offense. Dahn commented on how big of a role the offensive line played through the game. “Our offensive line blocked really well for us tonight allowing us to run the ball, and they did a great job as a unit tonight,” Dahn said. Both offense and defensive players after the game did not talk about how they felt they performed individually but instead how proud they were to play together as one. Sophomore defensive linemen Anthony Luke commented on how proud he was of the team as a whole. “We executed as a whole unit in all aspects of the game and it was great when that happens for us,” Luke said. The Beavers will now take on their 4-2 division rivals Sacramento City College at home on Saturday, in what should be a real challenge for them. Mike is a first-semester student on the Current, where he serves as co-sports editor. He is a majoring in communications and plans to transfer after graduation. 1 Comment on "Beavers’ defense shines on a rainy day"